When I was roasting pumpkins a couple of weekends ago, I didn’t have a lot of fresh ingredients on hand for dinner. All I had left in the garden were some snow peas, a couple of baby fennel, and a few stray San Marzano tomatoes. I really wanted to stay home all weekend, and the idea of a 40 minute run to the closest decent market didn’t hold much appeal. Between the root veggies and squash I’ve stored for winter, and a well stocked supply of dry goods and staples, and a freezer full of venison and an odd assortment of meats, I figured I should be able to pull something out of my hat. 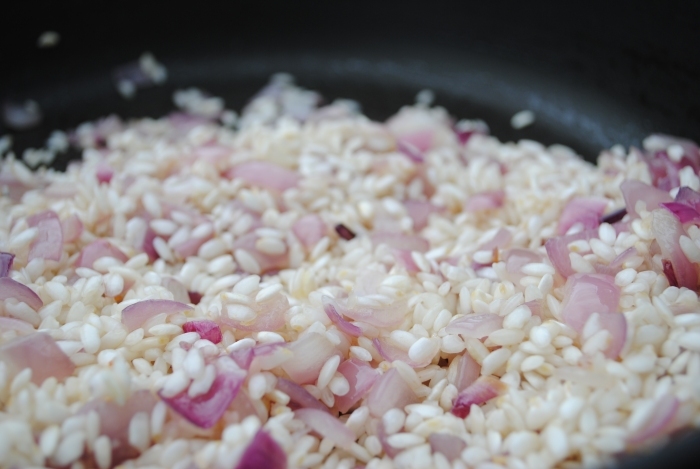 I was very happy with the results, but I think I’ll try it with cannellini beans in place of the barley the next time. I keep forgetting that my guys aren’t fans of barley like I am. 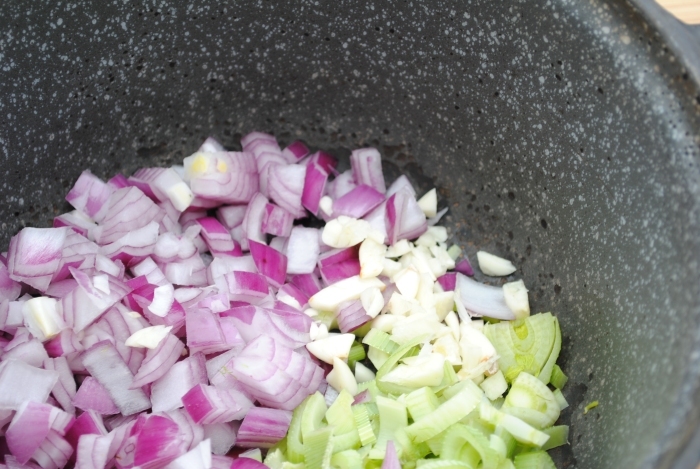 In a large soup pot over medium heat, soften onion, fennel,and garlic in 3 or 4 tablespoons of olive oil. ** Bunny Trail Alert ** I have to mention my enameled cast iron pot. When I was 5 years old, my family moved to Iceland where my parents were missionaries. While living there, my mom was given this pot as a gift. She cooked countless meals in the pot over the last 40 years. One of the ways my mom shows her love for people is by feeding them, and it’s a quality she passed on to me. Over the years, the outside of the pot has become perfectly seasoned. The inside shows the years, and the vitrified enamel coating has some worn and pitted spots. However, the imperfections in the enamel haven’t affected the pot’s ability to perform. I’ve been wondering if it’s possible to have the enamel restored. If anyone has information about restoring enamel, I’d love to hear from you. This pot represents all the love my mom has to give. For years I told my mom that I wanted her to be sure the pot be handed down to me when she was gone. I was completely shocked and pleased when she wrapped the pot and gave it to me for Christmas last year. Knowing how much I love this pot, my mom wanted the pleasure of watching me cook in it instead of waiting until she was gone. My family is very small, and of the four grandchildren there is only one girl, my sister’s 7 year old daughter. I hope Emma grows up loving to cook, because it would be a shame not to pass on this pot which represents the love of two generations. OK, back to our soup. 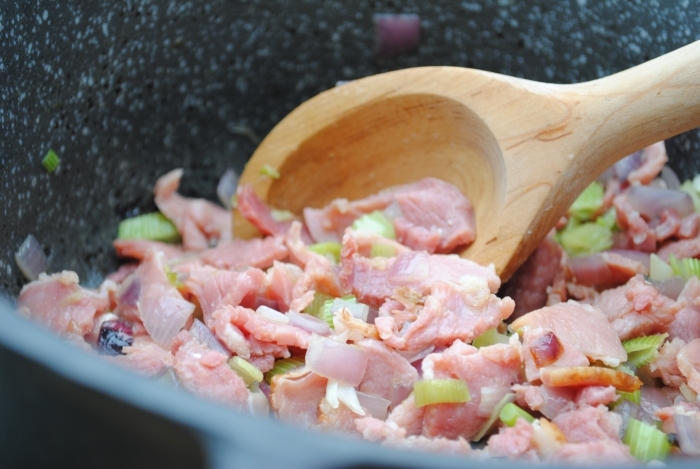 After softening the onion, fennel, and garlic, add the ham and cook for a few minutes longer. Next add the chicken stock, water, and barley. The ham trimmings I had in my freezer were rather salty, and after adding the chicken stock I realized that it needed a little water to tone down the salt. Turn the heat down, and continue to cook the soup on a low simmer until the barley is tender. As the soup cooks, you may need to make a couple of small additions of water as the barley absorbs liquid, and to account for evaporation. 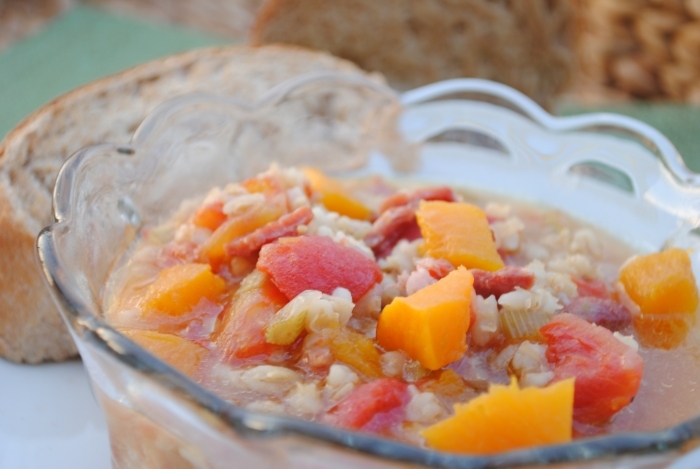 Once the barley is done, add the tomatoes and pumpkin and cook a little while longer until the vegetables are heated. While the soup was cooking, I threw together a nice crusty whole wheat bread which was perfect with the soup. As we head into the cold winter months, I’ll be baking bread and will share a few of my favorite recipes and techniques. A couple of weeks ago a friend told me he had a Japanese friend who wanted to know if the decorative pumpkins sold in grocery stores could be prepared to eat. 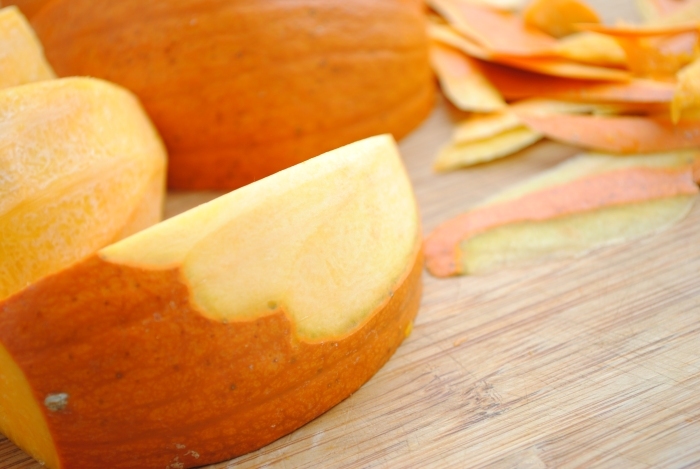 The small pumpkins (about the size of a cantaloupe) are usually sugar pumpkins (aka pie pumpkins), and are the best type for eating. 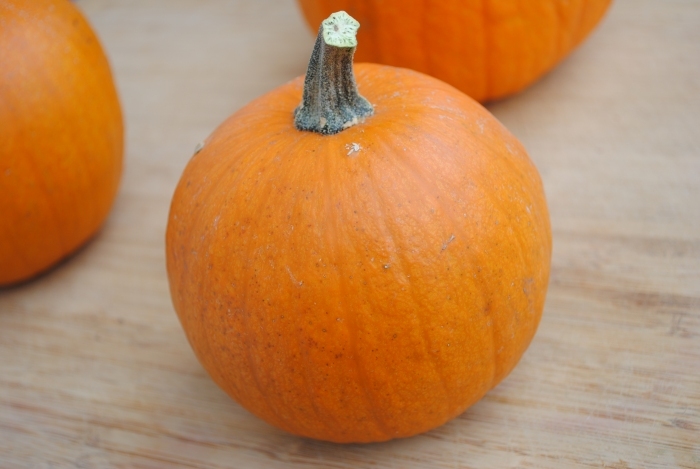 Each fall I usually get a few organic sugar pumpkins from a neighboring organic farmer. I roast them and then freeze for later use (pumpkin ravioli, pumpkin risotto, pumpkin cookies… stuff like that). 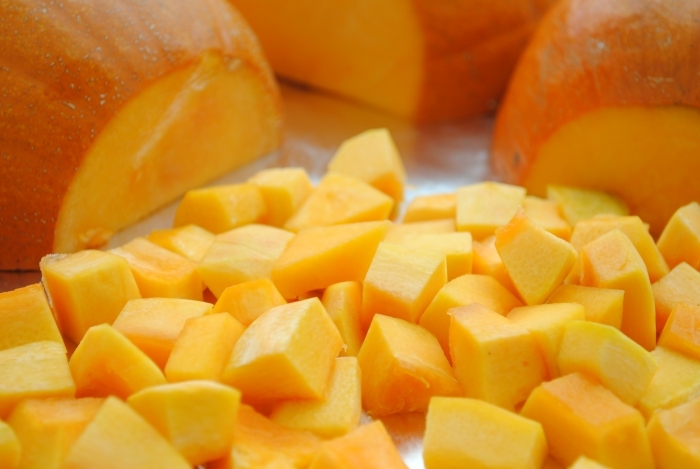 Pumpkins sold for carving are edible, but don’t taste as nice as sugar pumpkin. 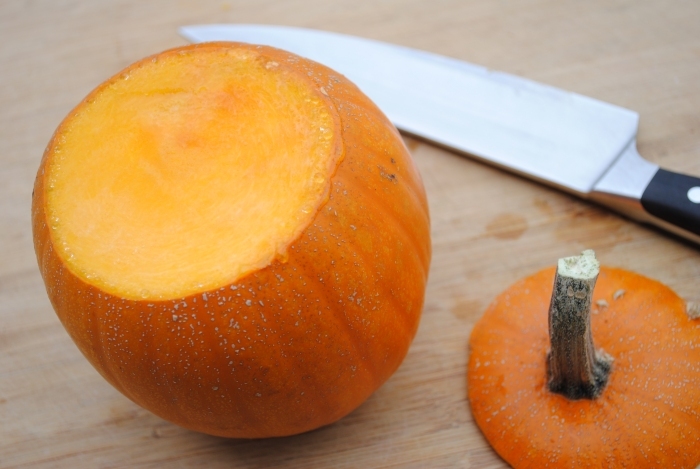 I don’t know if I’m imagining it or not, but it always seems that I get the best flavor from smaller pumpkins, so I try choose the really small ones…. a little larger than a softball, but no larger than one of those mini basketballs. Additionally, the smaller size is so much easier to handle. 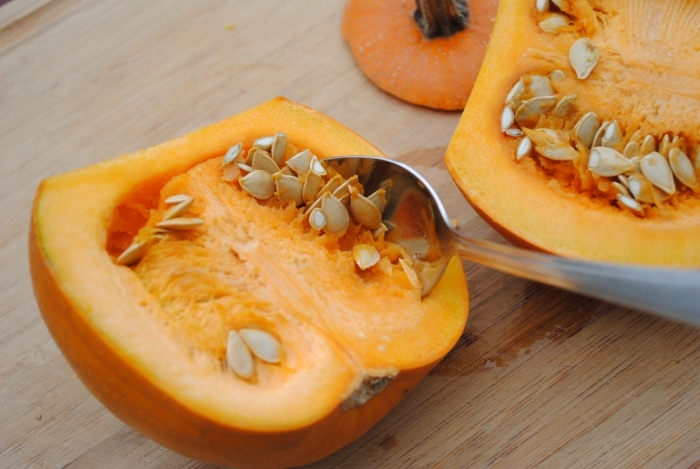 I’m sure you can find a bazillion different instructions online for roasting pumpkin. This is just my way of doing it. One quick tip: a good sharp 8 or 9 inch chef’s knife makes quick work of the job. Just be sure to take your time and be safe. First, remove the stem end. 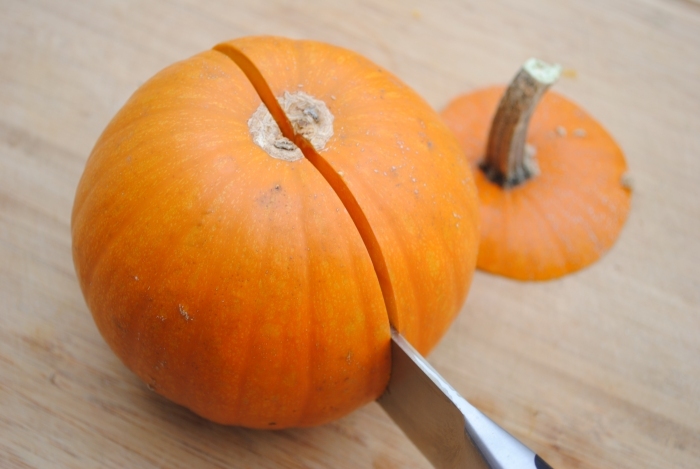 Next, flip it so it’s standing on the flat, cut end (safety precaution) and slice it in half. 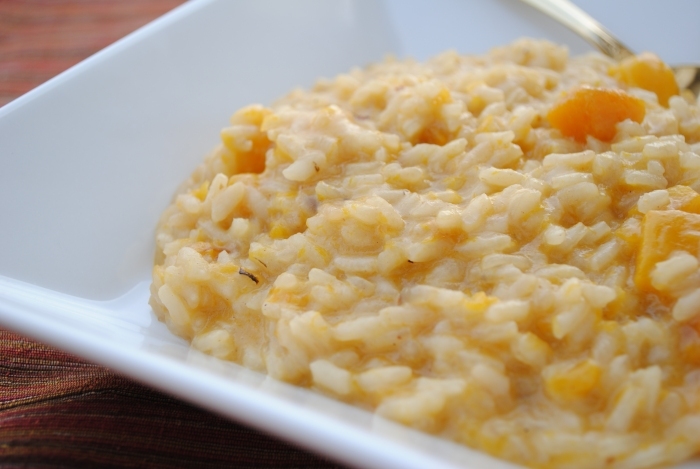 I usually just roast the halves, but this time I wanted some chunks for pumpkin risotto, so I roasted some both ways. I cut a couple of the halves into wedges, peeled with a vegetable peeler, and diced. 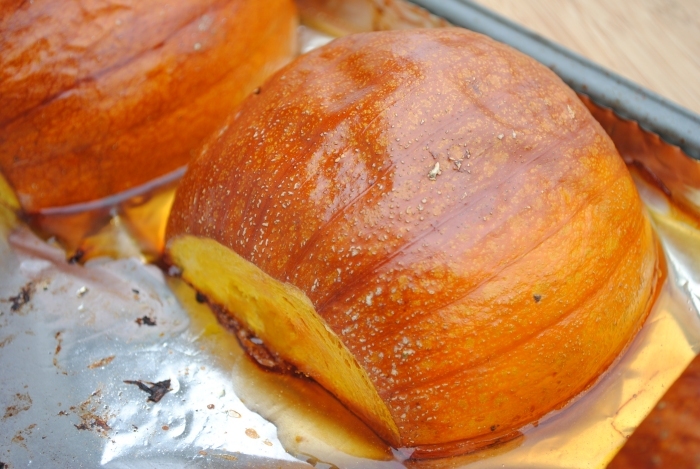 Place pumpkin halves on a foil lined baking sheet, cut side down, and roast in a 400°F oven. 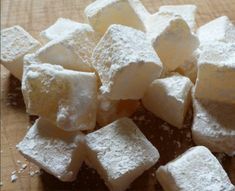 If you place them cut side up, water will collect in the hollow, keeping the sugars from caramelizing. 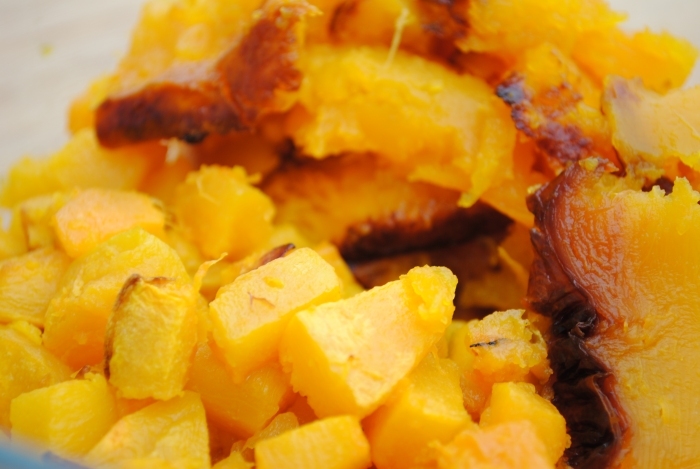 Caramelization is what you want, and where all that nice roasty pumpkin flavor comes from. ** Bunny Trail Alert ** I learned something from my oldest teenage son a couple of years ago. 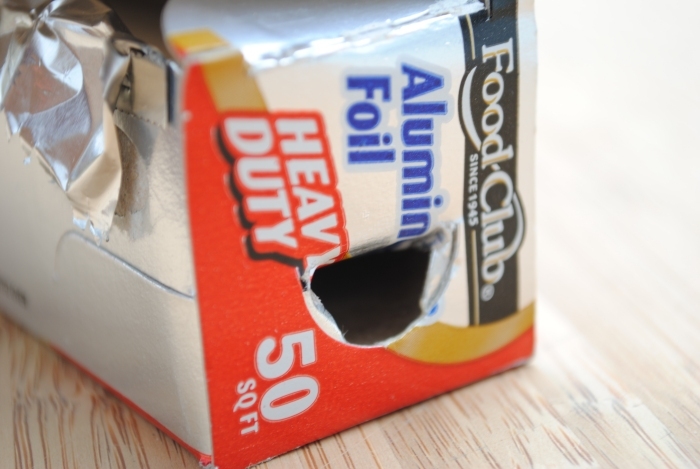 Did you know there are lock tabs on the ends of aluminum foil boxes? I didn’t, and they’re absolutely genius. They keep the roll of foil from coming out of the box when you’re trying to tear a piece off. I removed the diced pumpkin from the oven after about 15 minutes, and then shoved the halves back in for a total roasting time of about 30 minutes. Roasting time may vary depending on the size and thickness of the pumpkins. Roast until fork tender and slightly browned. My skins bubbled up a bit, and there was a beautiful clear, thick orange liquid on the baking sheet. Be sure to use the juice, as it’s packed with flavor. Scoop the roasted flesh from the skins to use in your favorite recipes. You can also freeze for later use. 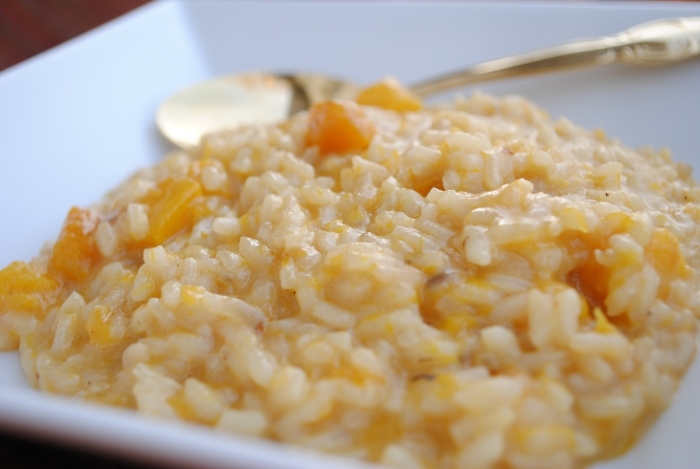 In my next couple of blog posts, I’ll give you my recipes for Pumpkin Risotto and Autumn Ham Soup with Pumpkin & Barley.